Will 2012 be the Year of the Credit Card? Regular readers may remember this blogger's favorite quotation (first said by John Kenneth Galbraith? ): "The only function of economic forecasting is to make astrology look respectable." Well, there are plenty of people out there who'd argue that the only function of financial blogging is to make economic forecasting look respectable. So, with that less-than-ringing claim to credibility in mind, here are three predictions about credit cards for 2012. One of the big changes in credit cards over the last few years has been the switch to variable rates. It's rare now to find a card that offers fixed rates. The good news is that credit card rates are to some extent tied to wider money rates, and few economists expect those to rise significantly anytime soon. For example, both Fannie Mae's and the Mortgage Bankers Association's latest predictions (at the time of writing) are for mortgage rates to rise only very slowly and by a very little bit in 2012. Fannie Mae says that it expects the 30-year fixed-rate mortgage rate to rise by just 0.1 percent to 4.2 percent over the coming year, while the MBA expects it to reach 4.4 percent in the last quarter 2012. The bad news is that many card agreements allow issuers to raise variable rates even if published prime rates stay the same. So if, for example, issuing banks find their profitability being squeezed, they may be able to raise your credit card interest rates regardless of the rest of the lending market. On balance, you probably don't have to worry too much about the cost of your card borrowing increasing substantially this year, but you might still want to keep your credit card debt low so that you're in a strong position if rates rise more quickly in 2013 or beyond. For a while back there, consumers worked hard to pay down their balances while credit card companies "charged off" (wrote off their books and passed to collection agencies) billions in defaults. According to the Federal Reserve, "revolving credit" (which is nearly all credit card debt) plummeted to $800.2 billion in 2010, down from $957.5 billion in 2008. Balances fell by 9.6 percent in 2009 and 7.5 percent in 2010. However, that rate of decline has slowed dramatically this year, and the second quarter showed a small rise (1.5 percent at an annualized rate), while both September and October have also seen increases, though even tinier ones. The question is whether consumers are ready to loosen their belts further, and begin to build up credit card debt again. Well, there are signs that they may be. They're certainly more relaxed about using their cards. On Nov. 2, MasterCard announced its latest results, and, according to Bloomberg, "Credit-card spending worldwide rose 21 percent to $469 billion from $389 billion a year earlier." Some of that increase in card spending may be down to the much better credit card offers that issuers are coming up with. Overall, rewards credit cards, balance transfer offers and signup bonuses have become steadily more generous through 2011, and the competitive deals are proving irresistible to many. Meanwhile, credit card companies are fighting each other for market share, both by competing over deals and by significantly ramping up the number of offers they mail to consumers. The latter topped nearly 1.3 billion in the second quarter of 2011, up from about 850 million a year earlier, according to Reuters, quoting Mintel Comperemedia data. Although some issuers' new-found generosity over rewards credit cards may be a result of competitive imperatives, some is also due to unintended results of new government regulations. The Durbin Amendment capped the cut of each transaction that banks receive every time a debit card is used, but left credit cards unaffected. As a result, financial institutions are very keen to change your spending habits, encouraging you to turn more often to your credit card. Now that we've gotten used to favoring our debit cards, banks are practically having to reverse a cultural trend. With the rescission of debit card fee hikes, it may take yet more incentives to persuade debit card holders to switch back to credit. So stand by for further enhancements to credit card rewards, along with an even bigger wad of card solicitations in your mailbox. 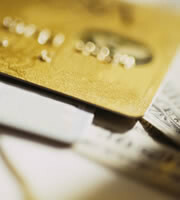 If those predictions prove correct, 2012 could be a good year for most credit card users. With luck, they can look forward to relatively stable rates and even more goodies. Issuers are taking a bigger risk than in the past by stepping up promotions and tempting consumers with deals to spend more on their credit cards…with the hope that higher spending will lead to balance carry-over. You don't need to be an economist, an astrologer or a blogger to predict that you may find 2013 a more comfortable year if you avoid, as much as possible, balance carry-overs in 2012. 0 Responses to "Will 2012 be the Year of the Credit Card?"